Beginning at 7 p.m. on Wednesday, June 21, construction crews will close I-70B eastbound at the US 6 interchange in Grand Junction, from Rimrock Avenue to American Way. 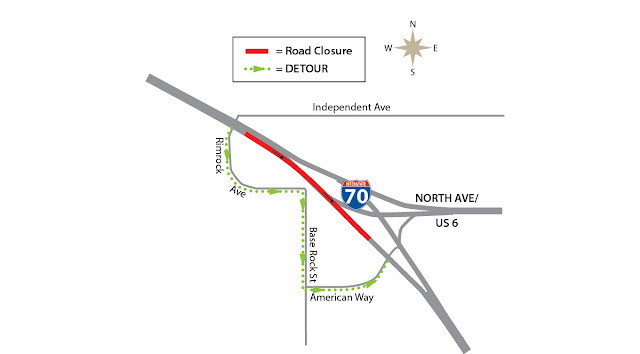 Motorists can connect back to eastbound I-70B by following posted detours along Rimrock Avenue and American Way. An alternate detour involves taking 25 Road south to Riverside Parkway, which will lead motorists into downtown Grand Junction. This configuration will be in place until 7 p.m. on Thursday, June 22. I-70B eastbound will reopen that evening. For additional information about this project, call the project information line at 970-822-7172, email the team at I70NorthAve@PublicInfoTeam.com. Information updated weekly regarding these restrictions and any safety critical traffic impacts can be found in CDOT’s weekly lane closure reports: https://www.codot.gov/travel/scheduled-lane-closures.html. For information on travel conditions visit COTrip.org, sign up for GovDelivery, or call 511. Updates are also available via Twitter @coloradodot and CDOT’s Facebook page at Facebook.com/coloradodot.